4.9 x 4.5 x 3.5 cm. 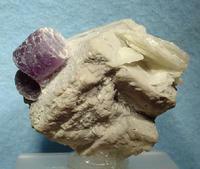 Gemmy, barrel-shaped, lavender lepidolite crystals to 1.3 cm are aesthetically set on a sharp, euhedral microcline crystal from the Himalaya Mine. 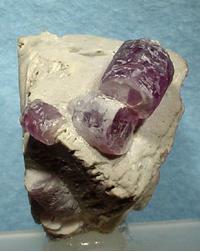 The microcline crystal has a distinct, 4-sided, pyramidal shape and is nicely accented by a bit of bladed cleavelandite.